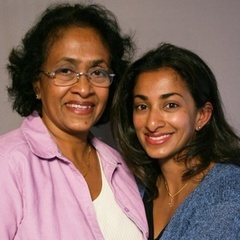 Mala Fernando tells her daughter Ashanthi Gajaweera about the early days of her marriage in Sri Lanka. Listen Here. Laura Greenberg tells her daughter, Rebecca, about growing up in Queens during the 1950s. Laura Greenberg came to StoryCorps with her daughter Rebecca. Laura grew up in Queens, New York during the 1950s. Here, Laura tells her daughter about some of her family's eccentricities. Majid Al-Bahadli and his wife, Diana Klatte, remember how they met. Majid Al-Bahadli came to the U.S. from Iraq after the first Gulf War. In this piece, Majid and his wife, Diana Klatte, remember how they first met. Pepper and Ron Miller talk about what led to their divorce. Ron and Pepper Miller met 25 years ago. They fell in love and got married, but it didn't work out. Here, they talk about what went wrong. Kelly Krieg-Sigman and her husband, Michael, talk about how they met. Kelly Krieg-Sigman and her husband, Michael, have been married for 28 years. Here, the couple remember how they first met. 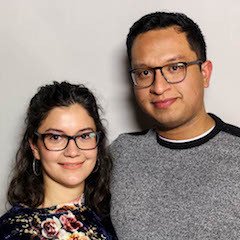 Rachel Salazar and her husband, Ruben, remember how their romance started with a typo. In 2007, Rachel Salazar lived in Thailand and Ruben Salazar in Texas. Despite being so far away, their email addresses were very close. Here, Rachel and Ruben remember how a typo brought them together. Andrea McKnight and her husband, Jay, remember meeting as teenagers in the 1950s. James "Jay" McKnight and his wife, Andrea, met as teenagers in Brooklyn, New York. Jay and his friends used to sing on the street corner, and Andrea was an admirer. Here, Jay and Andrea talk about how their early romance turned into a marriage that has lasted for more than 50 years. John Klein remembers meeting the love of his life, Mary Ann Allen, with her daughter Bernice Flournoy. John Klein tells Bernice Flournoy about falling in love with her mother, Mary Ann Allen, while he was working as a maintenance man at a senior citizen facility in Oakland, CA. Gweneviere Mann talks to her boyfriend, Yasir Salem, about living without a short-term memory. 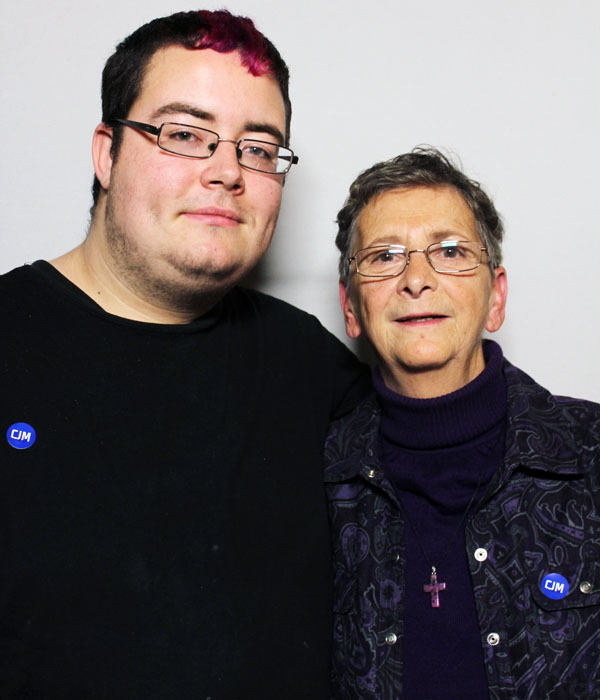 Her condition results from a stroke she suffered during an operation to remove a brain tumor. Chris Whitney tells his friend Erin Kuka about being diagnosed HIV positive early on in the AIDS crisis. Jim Fletcher remembers meeting his wife, MaryAnn, in first grade. Scott Wall and his wife, Isabel Sobozinsky-Wall, talk about their long-distance courtship that began on New Year's Eve. 92-year-old Martin Levin tells his granddaughters Jennifer Goebel and Zoe Crowe about a college classmate he didn't like. Martin Levin is 92 years old. Here, he tells his granddaughters about meeting their mother, and about how he has dealt with her passing. Peter Headen and his wife, Jacqueline, tell the story of their 40-year courtship. Peter Headen and his wife, Jacqueline, met for the first time in 1958 at a roller-skating rink on the Indian Head naval base in Maryland. They started dating soon after. But their courtship would continue for four decades, with lots of ups and downs along the way. At StoryCorps they sat down to tell their love story. Steven Ketcham and his wife Alexandra remember being set up by their parents. This is the story of a set-up. Alexandra Budny and Steven Ketcham first met in 2002. But this couple might have never gotten together if it weren’t for a secret plot — by Alexandra’s mom and Steven’s dad. Henry Flores and his wife, Gwendolyn Diaz, talk about the first time they met. Gwendolyn Diaz had just started a new job at St. Mary’s University in San Antonio, Texas, when she met her husband, Henry Flores, another professor there. It was the 1980s and Henry, who describes himself as “one of the original computer nerds,” was on his way to the computer room when the new faculty member caught his eye. Winslow Jackson and his wife, Dorothy, who both are living with multiple sclerosis, remember how they met. Winslow Jackson met his wife, Dorothy, in 2006. He was divorced. She was widowed. And they both had Multiple Sclerosis. While receiving rehabilitative care at an Atlanta hospital, they connected. And at StoryCorps, the couple remembered what drew them to each other. Van Harris and his wife, Shirley, remember being young in Brooklyn during the 1940s. Van Harris and his wife, Shirley, grew up a block away from each other in the Crown Heights section of Brooklyn. They met in the late 1930s, and at StoryCorps, they looked back on their old neighborhood and the characters who congregated at Dubrow’s Cafeteria on Eastern Parkway. Patty Woods remembers her partner, who left a lasting impact on her life. In the late 1970s, Patty Woods was a waitress at a restaurant in New York City when a customer caught her eye. They became friends and soon after, struck up a relationship. Years later, Patty lives in San Francisco. 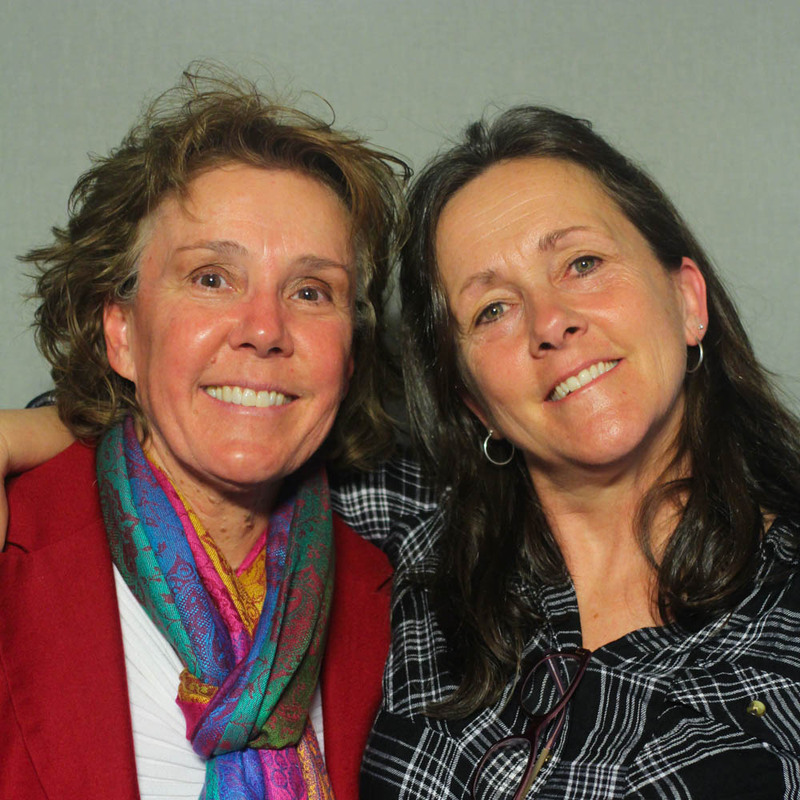 At StoryCorps, Patty told Cedar Lay about the lasting impact this partner left on her. Sandra Sowder (L) and Marcia Sutton (R) met in a small town outside of Huntsville, Alabama. Over time, they fell in love. When they made their relationship public, their worlds turned upside down. 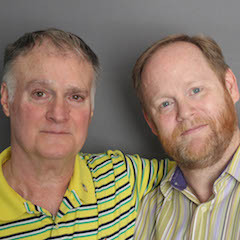 The couple sat down together at StoryCorps to talk about what happened next. Seth Smiley and Octavius Humphries had their first date on Christmas Eve. They discuss that and other memorable holiday events they have shared. Hoping to meet someone special, in 2010 Seth Smiley decided to give online dating a try. Soon after posting his profile, Octavius Humphries reached out to him and they began an email correspondence. Eventually they met in person, going on their first date on Christmas Eve. Unsure of Octavius’ plans for the holiday, Seth invited him to dinner the next night at his family’s Atlanta home. Octavius, who was still grieving the deaths of his parents, had, unbeknownst to Seth, planned on spending the holiday alone. Instead, he reluctantly accepted Seth’s invitation. At StoryCorps, Octavius (above left) and Seth (above right), along with Seth’s mother, Carole Smiley, sat down to remember their first Christmas together, as well as a more recent memorable holiday event. John and Carol met in 1964 when a computer dating service matched them up. This December, they will have been married for 52 years. In their early days, most computers were used for mathematical work, but a few were also used to help people find love. John and Carol Matlock met in what was a precursor to online dating--computer dating--where potential partners filled out a questionnaire and then mailed it in. Then, a person would create a punch card out of their answers and feed it through a giant computer that would spit out a few perfect matches. In just weeks (or sometimes months), that information would then arrive back in their mailbox. In 1964, John was working in electronics and frequently on the road without much time to date. Carol was a single mother concerned about finding someone who would love and accept her 2-year-old son, and while she wanted to date, she certainly wasn’t looking to get married. After filling out his profile, John remembers receiving the names and photographs of three women. But Carol stood out from the others with her attractive red hair worn in a French roll to one side so he picked up the phone and asked her out. Carol hadn’t received her matches in the mail and didn’t even know what John looked like when she accepted the date, but she knew that if her family didn’t like him, she wasn’t going anywhere with him. When John arrived at Carol’s house, he was surprised to find 16 other people waiting to meet him. Fortunately, he received a good report, and they were married less than a year later. John and Carol, who will have been married 52 years in December, recorded their first interview earlier this year using the StorpCorps app when their daughter, Karyn Servin, talked them about how they first met (you can hear that conversation below). More recently, they came back to StoryCorps to continue the conversation. Originally aired August 12, 2016 on NPR’s Morning Edition. Married for 25 years, Tabinda and Tariq were recent immigrants when they first met, and even without a common language, their love blossomed. 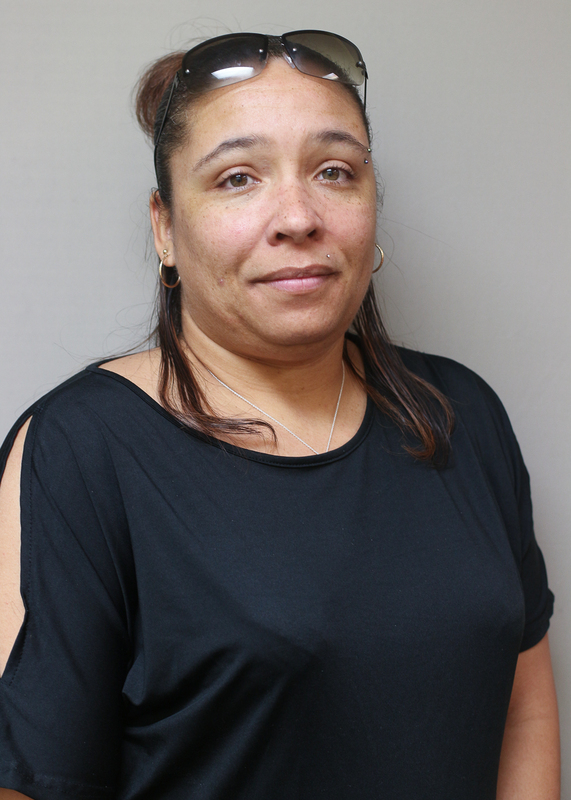 In 1989, Tabinda was working in a Manhattan hotel as a housekeeper. She had just immigrated to the United States from the Dominican Republic and one day at work, she caught the eye of a fellow employee who was working behind the hotel’s front desk--Tariq Sheikh. Tariq was also a recent immigrant, but from Pakistan, and he remembers that the first time he saw her, Tabinda was hard at work. She was still in her yellow gloves and neither spoke English too well, but after a few clumsy love notes, a relationship was born. 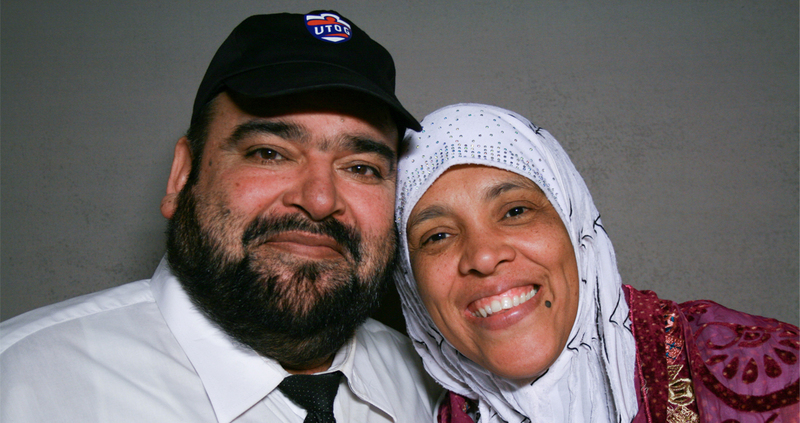 Tariq and Tabinda have now been married for 25 years and have a 20-year-old son, Madani Sheikh. They live in Jersey City, New Jersey, not far from the park bench they were sharing the first time Tariq realized he had fallen in love with Tabinda. They came to StoryCorps to share the story of how they met. Originally aired October 21, 2016, on NPR’s Morning Edition. When they met in 1983, Leslye was open about her sexuality while Mary kept hers private. With a family Thanksgiving approaching, that all changed. Leslye Huff (left) and her partner, Mary Ostendorf (right), met in 1983. Leslye was open about her feelings for Mary and wasn’t shy about publicly showing her affection--even on their first date. Mary felt less comfortable with public displays of affection and had not told many people in her life about her sexuality, including her family. Later that year, days before they gathered for Thanksgiving, Leslye picked up the phone and told Agnes the truth about her relationship with Mary. At StoryCorps, Mary and Leslye discuss what happened after the phone call and how their relationship with Agnes changed in the years that followed. Originally aired November 27, 2016, on NPR’s Weekend Edition. On June 12, 2016 a lone gunman killed 49 people at the Pulse Nightclub in Orlando, Florida.Among those killed was Deonka Drayton. She was 32. Deonka left behind a young son and her co-parent, Emily Addison. At StoryCorps, Emily sat down to remember her. There were hundreds of people at Pulse the night of the shooting, and some were able to escape in time. On June 12, 2016 a lone gunman killed 49 people at the Pulse Nightclub in Orlando, Florida.Among those killed was Deonka Drayton. She was 32. Deonka left behind a young son and her co-parent, Emily Addison. At StoryCorps, Emily sat down to remember her. There were hundreds of people at Pulse the night of the shooting, and some were able to escape in time. Many StoryCorps conversations touch on love, work, and death. But when Lynne Houston and her husband, Greg, sat down for their interview, they covered all of that and more just by talking about their first date. They met 25 years ago in Buffalo, New York. Lynne worked at a restaurant across the street from the funeral home where Greg was a mortician. Greg charmed Lynne, despite his work bleeding into their romance. When Greg picked her up for dates, he would sometimes be accompanied by an occasional corpse from the hospital. After six months, the couple took a romantic weekend away and drove through upstate New York — in his hearse. Lynne and Greg eventually married on All Souls Day and now live in McLeansville, North Carolina, where they recorded with StoryCorps. Many StoryCorps conversations touch on love, work, and death. But when Lynne Houston and her husband, Greg, sat down for their interview, they covered all of that and more just by talking about their first date. They met 25 years ago in Buffalo, New York. Lynne worked at a restaurant across the street from the funeral home where Greg was a mortician. Greg charmed Lynne, despite his work bleeding into their romance. When Greg picked her up for dates, he would sometimes be accompanied by an occasional corpse from the hospital. After six months, the couple took a romantic weekend away and drove through upstate New York — in his hearse. 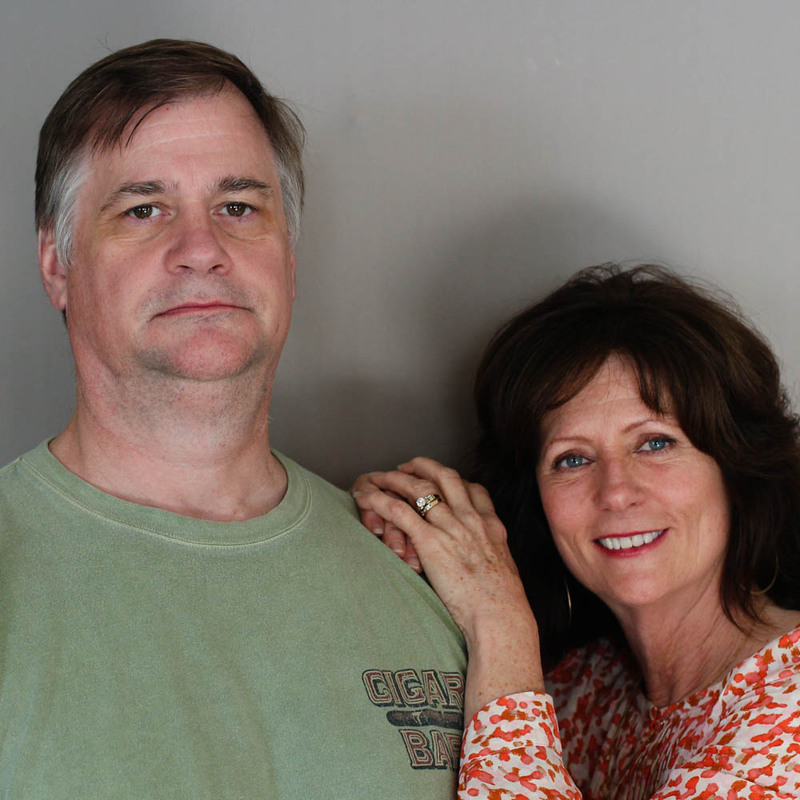 Lynne and Greg eventually married on All Souls Day and now live in McLeansville, North Carolina, where they recorded with StoryCorps. 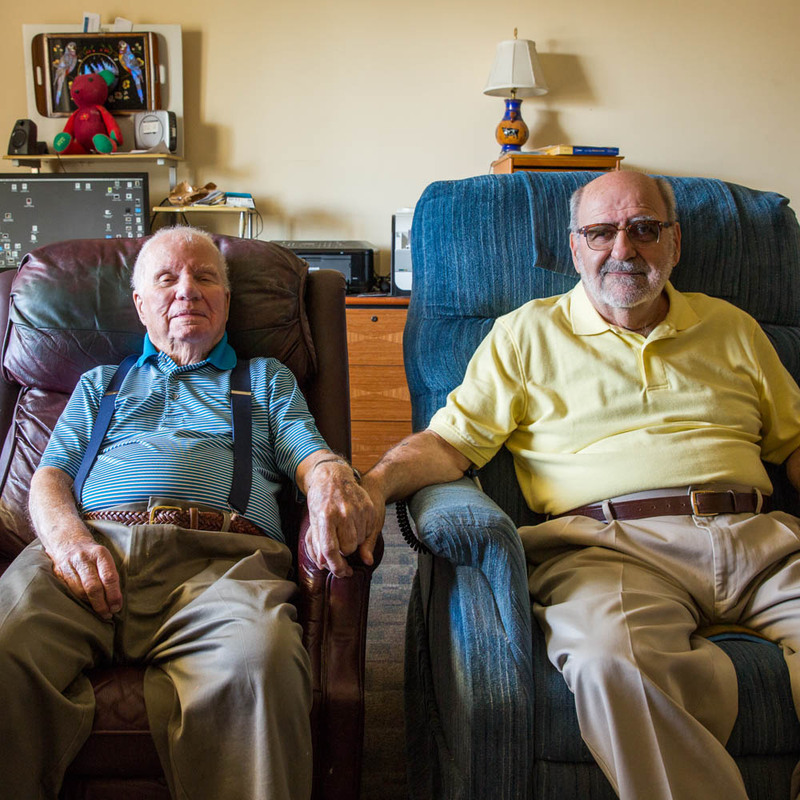 Military war veterans John Banvard (100) and Jerry Nadeau (72) live in a veterans home for seniors in Southern California. At StoryCorps, they talk about when they first met. Tracia and Patrick Kraemer met and fell in love at a resort just outside of New Orleans. The big difference in this love story? They met naked...at the last surviving nudist park in the state of Louisiana. De’Marchoe Carpenter and his wife Brandy Carpenter talk about the impact of his wrongful conviction on their relationship. The longest-running ice cream man, Allan Ganz, has been selling sweet treats since he was 10 years old. He shares with his wife, Rosalyn Ganz, how he got his start in the business and how he’s kept going for 71 years. Irakere Picon is an immigration lawyer who often defends undocumented immigrants. He happens to be an undocumented immigrant himself. He came to StoryCorps with his wife Arianna Hermosillo to discuss how that impacts their relationship. Liz Barnez and Lori Daigle felt an immediate spark when they met as teenagers. At StoryCorps, they sat down to remember how they reconnected decades later.